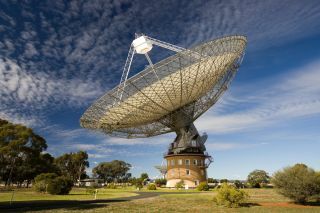 CSIRO's Parkes radio telescope in Australia spotted the first signs of a FRB. Follow-up observations identified its location and host galaxy, the first determination for an FRB. When the SETI community adopted protocols for telling the world that ET exists, people mostly got their news from radio, TV and newspapers. The year was 1989. The internet was a nascent U.S. military-backed project known as ARPANET – the Advanced Research Projects Agency Network. Facebook founder Mark Zuckerberg was 5. "There was no mention of the internet or social media because they didn't exist," said Arizona attorney Leslie Tennen, a member of the International Academy of Astronautics' SETI Permanent Committee. The protocols stipulate that the discoverer of a signal from an extraterrestrial civilization notify each of the parties to the "Declaration of Principles Concerning Activities Following the Detection of Extraterrestrial Intelligence" before going public with the news. RELATED: Kepler's 'Alien Megastructure' Star to Spill SETI Secrets? "This is designed so that a candidate signal can be tested and confirmed," Tennen said at the International Astronautical Congress in Mexico last month. The privilege of making the announcement, according to the protocols, is reserved for the discoverer. But in the age of Twitter, Tennen is not sure that confidentiality would be maintained. "It's difficult to imagine a discovery that would have a greater impact and consequence on society than the announcement of a confirmed detection of intelligent extraterrestrial beings," Tennen said. "The person making the announcement would be an instant international celebrity, never again to have a moment's peace." The allure of fame may bring pressure on someone to announce the discovery before it is confirmed. Plus, today there are many more researchers involved in the Search for Extraterrestrial Intelligence, or SETI, most of whom have not agreed to follow the voluntary protocols. The discoverer might, in fact, be someone's personal computer analyzing data for SETI@Home, a distributed computing project backed by the University of California, Berkeley. "The risk of unauthorized disclosure increases with the number of people having access to the information," Tennen said. With the rise of social media, Tennen said it is time to revamp the SETI post-detection protocol. One idea is to designate a single point of information for public release. "We foresee it more as a clearinghouse fir information, not as a censor of the information," Tennen said. "Of course, this presumes that the information is not going to be embargoed by the government. If that happens then we've got a whole different situation and this discussion takes a completely different track," he added. The original protocol was developed by the International Academy of Astronautics, with support from the International Institute of Space Law. It was presented to the United Nations' Committee on the Peaceful Uses of Outer Space, which adopted the doctrine as part of its official record, and endorsed by six major international space societies, said Paul Shuch, author of "Searching for Extraterrestrial Intelligence: SETI Past, Present and Future." The doctrine was revised in 2010, still with no mention of the internet or social media. Astronomer Dan Werthimer, co-founder and chief scientist for the SETI@Home project, said he believes the protocol should avoid stipulating a particular technology be used to publicize detection of a candidate signal. "These applications and technologies change so quickly," Werthimer wrote in an email. "All the information known about the candidate signal should be made public as soon as the candidate signal is independently confirmed," he added. "This info should be easily available to the scientific community, as well as the public, in all countries." Astronomer Seth Shostak, senior scientist at the SETI Institute in Mountain View, Calif., said there already have been many claims of a signal from ET, some of which were made by "uninformed" persons. "I'm less worried than reconciled," Shostak said.